With our roots firmly planted in North Carolina, at the heart of NASCAR country, racing is in our blood. From dusty dirt tracks to super speedways and from Red Bull Global Rallycross events to helping Martin Truex Jr and Furniture Row Racing win their first championship – we love racing. Since the early 1960’s, when Richard Petty began using WIX filters, generations of motorsports champions have driven to Victory Lane with WIX Filters. For us, the racetrack serves as a grueling testing ground for scenarios involving high temperatures, fluctuations in pressure and rapid breakdown of engine oil. WIX Filters engineers work side-by-side with the best crew chiefs and engine builders in motorsports, applying their research in the ultra-competitive world of racing to the everyday demands of light- and heavy-duty consumer and commercial usage. In 2018, we are proud to partner with Stewart-Haas Racing, Kalitta Motorsports and Dreyer & Reinbold Racing (DRR). WIX Filters supports Stewart-Haas Racing in the NASCAR Monster Energy Series with Clint Bowyer in the No. 14 Ford Fusion. WIX partners with NHRA team Kalitta Motorsports. The Kalitta partnership supports J.R. Todd, driver of the DHL Tyoyota Camry Funny Car, Shawn Langdon, driver of the Electronic Technology Global Funny Car, Doug Kalitta, driver of the Mac Tools Top Fuel Dragster and Richie Crampton, driver of the Lalitta Air Top Fuel Dragster. For the 2018 Indy 500, WIX Filters partners with DRR to support Sage Karam. WIX will support Christian Brooks and Travis PeCoy in the Red Bull Global Rallycross SuperCar Gold Class. Additionally, WIX supports almost every level of grassroots racing across the United States and Canada. We are the No. 1 filter in motorsports. 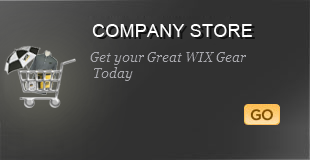 To see WIX in action, check out Facebook, Twitter, YouTube, Snapchat and Instagram or follow one of our partners.